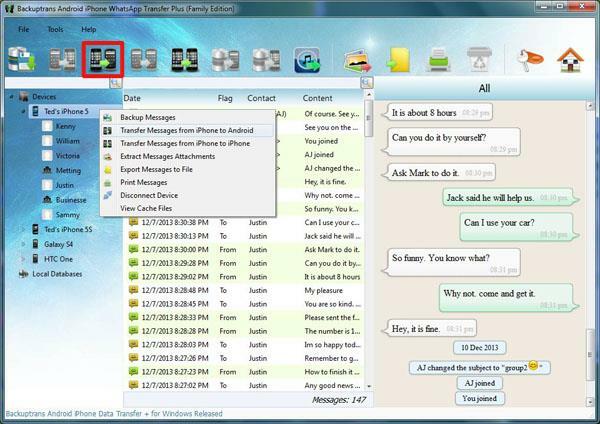 Got lots of WhatsApp Chat Messages Android & iPhone and want to share Messages between different devices(Android and iOS)? 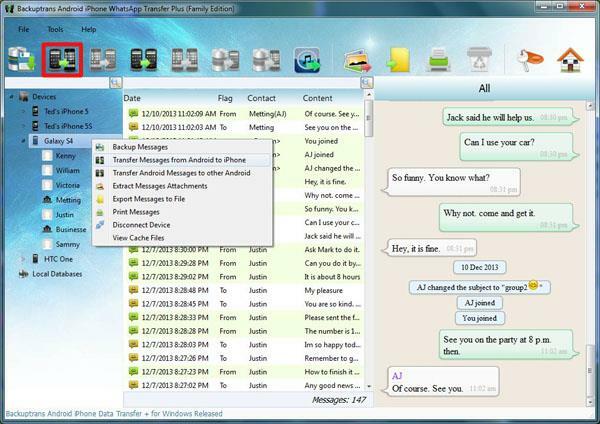 Backuptrans Android iPhone WhatsApp Transfer + must be the best WhatsApp migrating software which lets you transfer WhatsApp Messages with attachment between Android and iPhone directly on computer. Just connect both your iPhone and Android phone to computer and click the “Transfer” button, and you will get it done in a few seconds. All WhatsApp Messages will be transferred and merged perfectly on Android/iPhone. Transferring WhatsApp Messages between iPhones and Transferring WhatsApp Messages between Android Phones are also supported. No other WhatsApp transferring utility software can do this. Step 1: Install the software on computer and run it Run Backuptrans Android iPhone WhatsApp Transfer + and connect your Android & iPhone to computer with USB cable. Step 2: If a message pops out on your Android phone’s screen, please click “Back up my data” button without entering password. Then back to the software on computer to click “OK” to continue. 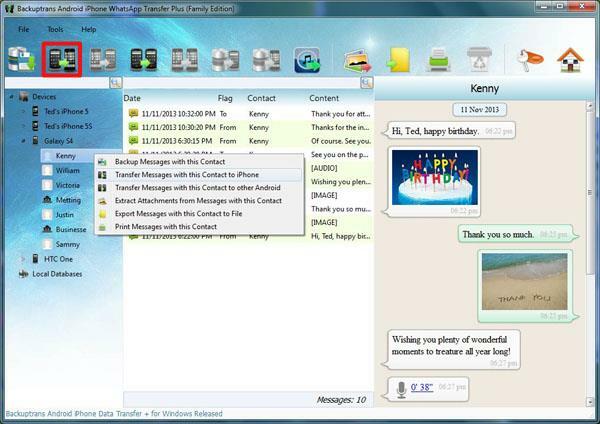 Note: The software will backup WhatsApp data only from your Android phone. Step 4-B: Transfer WhatsApp Messages with a single contact 1) Click your wanted contact name under device you want to transfer WhatsApp chats from. 2) Turn to top tool bar and press “Transfer Messages from Android to iPhone” button or go File -> Transfer Messages from Android to iPhone. Tip: Or you can right click the contact name and then choose “Transfer Messages with this Contact to iPhone”. Step 5: Choose an iPhone you want to transfer chats to Select a target iPhone that you want to transfer WhatsApp chat history to. Click Confirm to continue. Note: Before transferring WhatsApp chat history to iPhone, please close WhatsApp on your iPhone first. Step 4-B: Transfer WhatsApp Messages with a single contact 1) Click your wanted contact name under device you want to transfer WhatsApp chats from. 2) Turn to top tool bar and press “Transfer Messages from iPhone to Android” button or go File -> Transfer Messages from iPhone to Android. Tip: Or you can right click the contact name and then choose “Transfer Messages with this Contact to Android”. Step 5: Choose an Android Phone you want to transfer chats to Select a target Android Phone that you want to transfer WhatsApp chat history to. Click Confirm to continue. Note: Before transferring WhatsApp chat history to Android, please make sure you have installed and verified WhatsApp on your Android first. All your Whatsapp chat messages have been transferred and merged perfectly on your new iPhone/Android Phone. With Backuptrans Android iPhone WhatsApp Transfer +, you can even backup, restore, export and print WhatsApp Messages for your Android/iPhone easily on computer. Free download the software on your computer to try now. 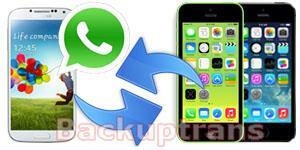 Note:If you are using Mac, please use Backuptrans Android iPhone WhatsApp Transfer + for Mac.